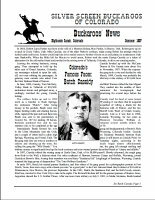 The Buckaroos' News (now out of print) was a publication of the Silver Screen Buckaroos of Colorado (SSBC) about Colorado's B-Western movies, actors, and famous faces. 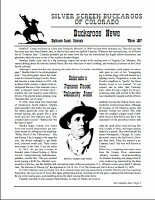 The Old Buckaroo (aka "Colorado") edited the newsletter quarterly from the Spring of 1996 through the Winter of 1997. 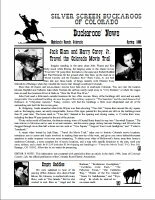 The first issue featured character actor Jack Elam and veteran Harry Carey, Jr., as they traveled the Colorado movie trail through southwest Colorado. 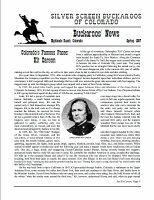 We also had articles on "Colorado Movie Trivia" and "Colorado Cowboys," plus a piece on "Cowboys, Gold, and the Chapter Plays." 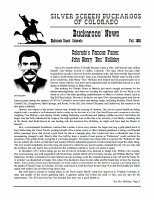 "Colorado's Famous Faces" featuring Wyatt Earp, John Henry "Doc" Holliday, William Barclay "Bat" Masterson, Kit Carson, Butch Cassidy, Bob Ford, and "Calamity Jane." "Coloradans In the Movies" such as, Budd Buster, Ken Curtis, Olin Howlin, Arthur Loft, Denver Pyle, Marshall Reed, Grant Withers, and Walter Sande. 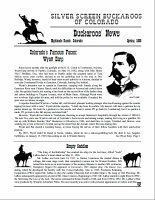 "Code of the West" including quotes from Roy Rogers and William "Hoppy" Boyd. 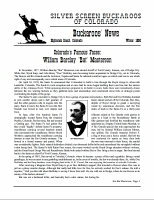 "Yesteryear" featuring historical happenings in the real Old West of 110 years ago. "Cowglish" from Tex S. Ryder's 1982 book Cowboy/English--English/Cowboy Dictionary. "Old Coot Witticisms" from Roy English's 1995 book When I am an Old Coot. Roy Rogers' "Cowboy Prayer" used by the King of the Cowboys at all his Riders Club meetings. 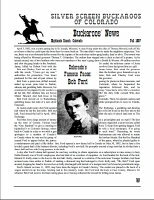 "B-Western Reading" which featured The Westerner, Country & Western Variety, Westerns and Serials, and Western Clippings (we know Boyd Magers read the newsletter, as he now uses one of the graphics we created of a cowboy at a computer screen that displays a stagecoach!). 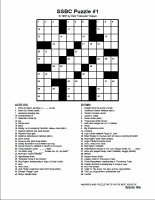 our own 11x11 professional-looking crossword puzzle! "We hope you've enjoyed our little newsletter as much as we've enjoyed bringing it to you. Once in a while, you may read an article or two written for other publications, so we won't disappear entirely. Happy Trails, buckaroos!"